Chelsea winger Willian has made it clear he hopes Eden Hazard stays at the club instead of sealing a transfer to Real Madrid. This long-running transfer saga really seems to be gaining ground at the moment as the Belgium international edges worryingly close to the end of his contract. 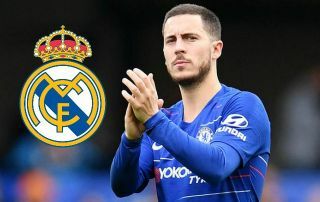 This puts Chelsea under real pressure to cash in on Hazard soon or risk losing him on a free transfer at the end of next season. The Telegraph are among the outlets to strongly link the 28-year-old as a top transfer target for Real Madrid, and have stated Chelsea seem increasingly resigned to losing their star player. Willian, however, says Hazard himself has not mentioned anything about a move to the Bernabeu, as he essentially pleaded with him to stay at Stamford Bridge when he spoke in a press conference this evening. As the quotes above show, Willian tried a charm-offensive on Hazard, praising him as one of the best he’s played with and suggesting he’s been very focused and professional. Chelsea fans will hope this can be enough to prevent a disaster this summer.